Whether your data it is in cloud or on-premises it holds the key to answering many strategic questions. Thus, businesses are now contemplating new ways to tap into their data and derive meaningful insights for enhanced business outcomes. But with traditional BI platforms, connecting to multiple data sources and converting the information for business intelligence becomes an impossible task. Cloud-based business analytics platforms, like Power BI, can be crucial to overcoming such challenges. EPC Group’s team of BI consultants can develop custom Power BI reports and visualizations for organizations to their bring business-critical data to life. Data that has been provided from sensors and machines, enables faster decisions than the conventional ones made with offline data. However, analyzing and visualizing this data is what is most critical for businesses today. When organizations adopt the Power BI platform they can dive into advanced analytics and gain powerful insights to predict outcomes. Our team of Power BI consultants can help with strong BI planning and strategy, to help you uncover hidden trends and unknown correlations through captivating and compelling visualizations that are necessary to enable quicker more intelligent decisions. Modern-day business leaders are looking to innovate and lead in this data-driven business world. Mobile business intelligence can be the key to monitor and access your business information at any time regardless of location. Adopt and embrace Power BI, get the business-critical data at your fingertips and publish custom Power BI dashboards on the web and across mobile devices. With Power BI based native mobile BI apps, users can easily and securely view live Power BI reports. 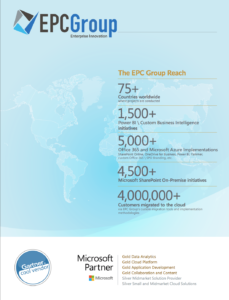 EPC Group’s team of senior Power BI consultants will develop a dynamic business intelligence platform that provides a compelling 360-degree wide view of your business in the form of interactive data visualizations and reports. EPC Group specializes in serving small to medium-sized businesses with flat-rate customizable IT support and consulting plans designed to minimize risks, streamline operations, reduce stress, stabilize networks and secure your technology. So now you can focus on business instead of technology hassles and distractions. Whether you have an in-house IT department who needs occasional help with projects, strategy or ideas; or you need a complete Managed IT Services and IT Support provider; or you’re looking for a local cloud service provider with 24/7/365 support, EPC Group is here for you! If you don’t have the time, it’s not in your wheelhouse or you simply don’t want the burden of managing an internal IT resource then EPC Group is the answer. It’s like having your own virtual IT department at a fraction of the cost of hiring an IT employee. When you sign up for EPC Group’s Managed IT Services we make it easier than ever for you to understand, budget and manage your monthly IT needs and requirements. Aside from a long list of features, each plan includes expert-level advisory services, training, consulting and everything that a large organization’s IT department would offer. Are you storing any Personally Identifiable Information (PII)? Are you storing HIPAA or PHI data within your organization’s systems? Are there any globally specific regulations such as US-EU Safe Harbor that must be taken into consideration? EPC Group’s hybrid SharePoint 2019 environment’s architecture allows for flexibility and provides for the capability to store sensitive and highly confidential content on-premise within your own data center while storing collaboration or non-sensitive data within a public cloud such as Office 365, SharePoint Online, Microsoft Azure or AWS. EPC Group provides expert consulting services around your organization’s data that may have specific regulatory considerations. There are laws and industry-specific questions that must be considered because if they are ignored the organization may be open to litigation or penalties. EPC Group’s approach covers environments that are both on-premise (private cloud), in the cloud (public cloud) or are hosted in a combination with resources in both types of environments in a “hybrid cloud” scenario. EPC Group provides for industry-leading upgrade and migration services for SharePoint 2013, SharePoint 2010 (SharePoint Server or Foundation) and SharePoint 2007 (SharePoint Server or WSS 3.0) into SharePoint Server 2019. We will work with you to help define the overall scope as well as Identify the underlying tasks and milestones that will be required to meet your objectives. Solutions for upgrade approach, information architecture and system architecture & support for organizations that have multiple SharePoint instances or multiple versions (organizations which have both SharePoint 2010 and SharePoint 2007 environments). Solutions for upgrade and migration initiatives for organizations with both SharePoint and non-SharePoint based systems. Are there existing custom features or workflows that are required to be “interoperable” between your existing SharePoint 2010 platform and the new SharePoint 2019 environment? EPC Group has experience in upgrade and migration initiatives of any size from both a “total user base” as well as “content database and sizing” perspective. We also provide for solutions to organizations that may have “known migration issues” such as RBS configurations and related SQL Server database “flags” that must be resolved or customizations that must be re-architected or deprecated and then implemented within the new SharePoint 2019 framework. EPC Group’s senior SharePoint architects and development teams can provide you with solutions to resolve any issues you are facing as we have experience on hundreds of previous SharePoint upgrade and migration efforts and pull from these “from the consulting trenches” strategies and lessons learned. You will know you are engaging with a trusted partner who will ensure your high-profile project is a success.